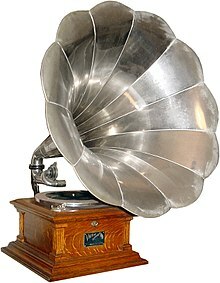 After electrical disc-playing machines appeared on the market in the late 1920s, often combined with a radio receiver, the term "record player" was increasingly favored by the public. 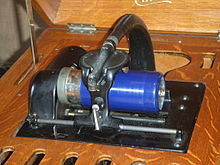 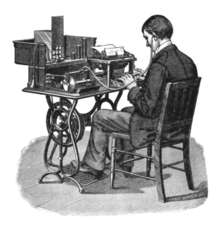 Manufacturers, however, typically advertised such combinations as "radio-phonographs". 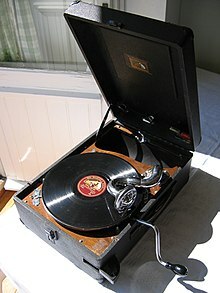 Portable record players (no radio included), with a latched cover and an integrated power amplifier and loudspeaker, were becoming popular as well, especially in schools and for use by children and teenagers. 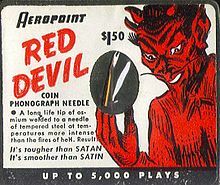 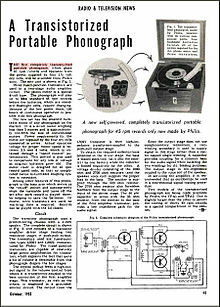 In the years following the Second World War, as "hi-fi" (high-fidelity, monophonic) and, later, "stereo" (stereophonic) component sound systems slowly evolved from an exotic specialty item into a common feature of American homes, the description of the record-spinning component as a "record changer" (which could automatically play through a stacked series of discs) or a "turntable" (which could hold only one disc at a time) entered common usage. 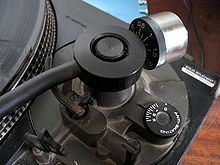 By the 1980s, the use of a "record changer" was widely disparaged. 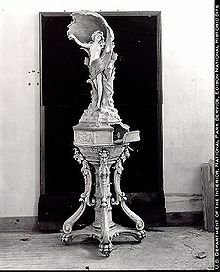 So, the "turntable" emerged triumphant and retained its position to the present. 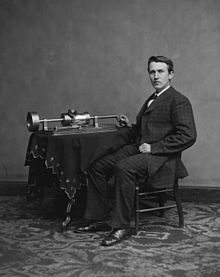 Through all these changes, however, the discs have continued to be known as "phonograph records" or, much more commonly, simply as "records". 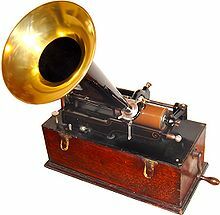 Wikimedia Commons has media related to History of sound recording. 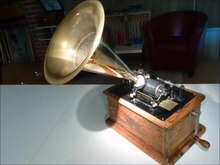 "I Am The Edison Phonograph"
This 1906 recording enticed store customers with the wonders of the invention. 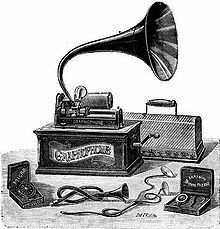 Wikisource has the text of The New Student's Reference Work article "Phonograph".